You may have already heard rumblings about the new show currently playing at The Public. Thanks to a dear friend of mine and her poor boyfriend’s food poisoning symptoms (feel better! ), I scored tickets to Here Lies Love last Wednesday night. This was the first show I went to see that I consciously knew I’d be writing a blog post afterward, and I’m so glad it was this one. Go get your tickets now for a fun, unusual, engrossing night at the theatre. Prices are steep (around $90), but you can check out the rush policy here. First though, a heads-up: this is an immersive theatrical experience. You stand for the duration of the piece and move around the room as the space shifts via rolling platforms. There is some optional seating up above on the second level, but if you’re going to spend the money, definitely be on the main floor for the full experience. It’s about 90 minutes with no intermission so just wear comfortable shoes and check your bags. And to those of you who fear the interactive elements of theatre, don’t worry! You will not be forced to go up on stage and perform. The “worst” that can happen is an actor might shake your hand or address you in the crowd. Oh, and you do a line dance à la the electric slide with the rest of the audience. Get pumped. But I’m getting ahead of myself; let me back up. 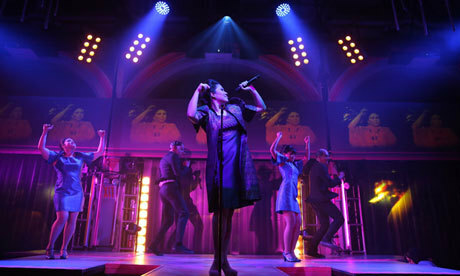 Here Lies Love tells the story of Imelda Marcos, the former First Lady of the Philippines. We begin in 1946 when she was 17 years old and progress through her courtships, marriage, rise to power, and subsequent fall after the People Power Revolution which culminated in 1986. Now simply add a dose of projections and the music of Fat Boy Slim, and you have an innovative, refreshing new production. Yes, you heard me right, that Fat Boy Slim. 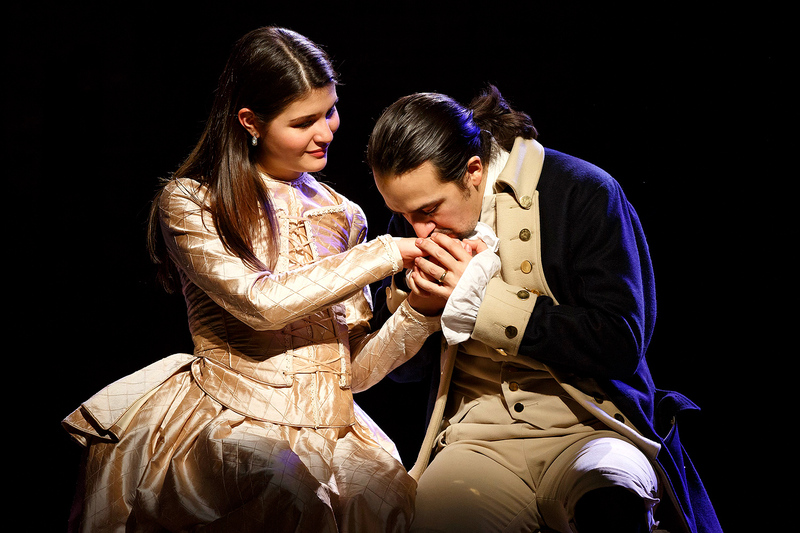 Originally released as a concept album in 2010 by FSB and David Byrne (founder of the band Talking Heads), it has been developed into a rock musical directed by the great Alex Timbers (Bloody Bloody Andrew Jackson, Peter and the Starcatcher). A blend of rock, disco, and techno music fills the house as you enter what could be a club downtown, albeit much tamer than Stefon’s idea of New York’s hottest club. The DJ is on the second level pumping heavy bass, an enormous disco ball hangs from the rafters, and colored lights, strobes, and abstract projections paint the walls. When the show begins, it hits the ground running. The 90-minutes are jam-packed with catchy, melodic songs, inventive choreography, and a cast that has energy coming out of their pores. One of the greatest, surprising takeaways was how much I learned. Not only was I moved by the story, but I was learning a part of Filipino history about which I’m embarrassed to say I didn’t know much. I went home wanting to learn more and followed up with my own research (thanks Wikipedia). An entertaining history lesson was the last thing I expected (I honestly went to the show that night thinking I was going to see a rock Filipino version of Evita). The projections feature real-life footage of Imelda, President Ferdinand, and Senator Aquino, and as the platforms spin and we’re led around the theatre, we are guided forward through time, seamlessly shifting focus from Imelda to the Filipino people and their struggles. What ultimately affected me the most was the immersive experience because that’s exactly what we were: fully immersed. We were not just moving around the set like cattle as an unidentified mass. Rather, the audience is serving a purpose, playing either the role of citizens from around the world or the Filipino locals. We are another character in the show; the actors address us directly as they are interviewed by reporters, make political speeches, and ask for our vote. We are just as crucial as the actors on stage in the events of this story. In the program notes, Oskar Eustis (the Artistic Director of The Public Theater) writes, “The goal [was] to create an immersive musical theater piece that is both an amazing environmental event and a powerful narrative.” They have definitely succeeded.